Caitlin had another *beautiful* beam routine, and she seems to have overcome her cart wheel problem. I thought her performance on the uneven bars was excellent, but the judges must have spotted some technical flaws that I missed. She did a very nice floor routine, but she put her hand on the floor when she wasn’t supposed to, which gets counted as a fall (an automatic 0.500 deduction). Her all-around score is still climbing, and I think it will continue to do so throughout the season. She placed third all-around in a very crowded field. Great job, Caitlin! [Pozsar’s Gymnastics] team took first place again at this meet. I don’t think any of the parents were expecting this, because there were some *very* good teams competing in level 6. We have only a single gymnast at this level, but between her and the outstanding efforts of our level 5 team we managed to take home the first-place “trophy”–a plastic bucket. 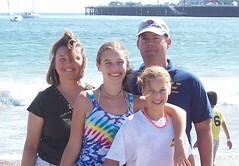 Many of the gymnasts’ families spent the whole weekend in Scotts Valley/Santa Cruz. Most of us stayed at the [Scotts Valley Hilton], which was pretty nice, although (like everything around Santa Cruz) it was pretty expensive. Given the choice of saving ~$20 by staying in a dive, I would fork out the extra $20 to stay at the Hilton again. 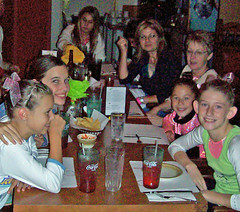 After the awards ceremony, about half of us got together for dinner at [Maya Mexican Restaurant] to continue our new post-meet tradition. The food was okay, but I think we’ll try to find someplace else to have our team dinner next year. We also need to coordinate a little better–we heard that several of the families had been planning to go to the team dinner, but we must have missed them after the awards ceremony. We should research our dining options before the meet (when we have Internet access), then make plans while the girls are warming up. On Sunday morning our family had breakfast at [Auntie Mame’s Cafe], a funky little family-owned place with great biscuits and gravy. (Actually, *everything* was good, but the biscuits and gravy were outstanding!) We learned later that most of the team had eaten here at least once during the weekend, and everybody loved it. We’ll definitely be coming back to Auntie Mame’s Cafe next year! 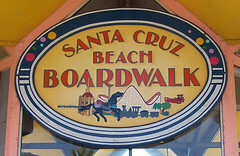 We spent Sunday afternoon at the Santa Cruz Beach Boardwalk. All the kids liked the boardwalk, but the beach itself was the biggest hit. (And it was free!) Parking near the boardwalk was a pain, and it was fairly expensive–$10 IIRC. 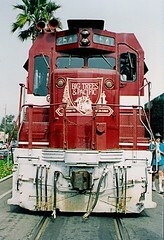 The first thing we saw when walking up to the boardwalk entrance was the [Santa Cruz, Big Trees and Pacific Railway]. If we’d known about this earlier, (and we had a bit more time to spare), we could have driven to the [Big Trees state park] and looked around, then taken the railroad from Felton right to the boardwalk. Ah, well… It gives us something to look forward to next year. We had a great weekend in Santa Cruz, and hopefully next year will be even better! 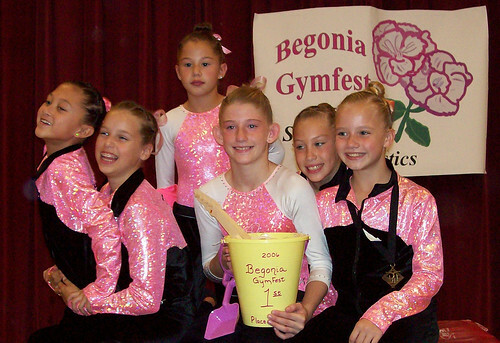 This entry was posted in Uncategorized and tagged begonia, caitlin, gymnastics, santa_cruz. Bookmark the permalink.